Home > Graphics > Show Us Your Desktop! Since it’s year end, I thought I’d post one more “fun piece” for everybody. After Thom posted an article on his customized KDE desktop, I thought it might be interesting to compare desktop screengrabs and see what other OSNews’ers desktops look like. Are you cluttered or clean? Are you minialist? What’s your wallpaper? 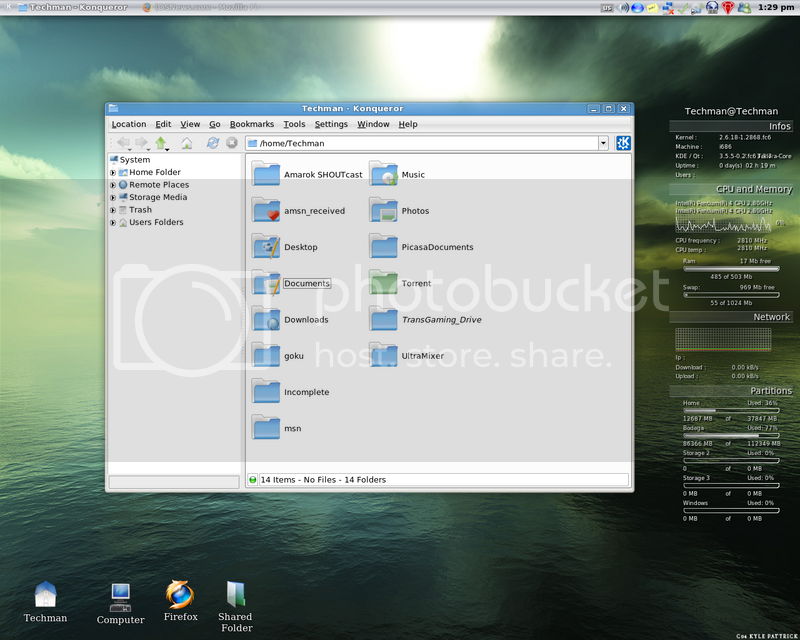 Upload a picture to an online service or your own website and show off your desktop. I’ll start: Adam’s desktop (312kb). well , i am a kde user , and i like, no , i really love a nice desktop. Gentoo box with Fluxbox and KDE Kicker, Adesklets, and (less importantly) KNotes. nerdy, but still I want to contribute. Normally both panels have autohide on. Tray: gmpc, gaim, xpad. Desktop screenshots are so cool! I made a couple of screenshots of my ratpoison desktop just to show off a little. edit: Linked to thumb on accident. * no icons on the desktop, my windows desktops always end up really cluttered, so on linux(my main os) I wanted _nothing_ on the desktop. * I wanted to be able to run the same environment on my then underpowered laptop and my main computer. * I have to be able to control volume and playing/pausing/resuming the mp3 player that is constantly playing without having to restore the window. * I’m an alternating php/c/c++ developer, so I need to have a browser constantly open to look up documentation, an editor to code, a (fast!) terminal to ssh to remote machines, a MUA to read/write emails, and an mp3 player to play some music while coding. None of the programs have high requirements(except firefox), and fit completely on a very custom gentoo 64Mb system. The only big dependency of most of the programs is gtk+, but as it is a common dependency, it is only loaded once in memory. I haven’t changed the desktop since then(except for some slight adjustments), and I must say I find it pretty comfortable for everyday use, on 3 computers with different resolutions(from 1400×1050 to 1024×768, and previously on 800×600). It changes constantly – every three minutes. Running on Kubuntu 6.06, by the way. I was going to include a shot of Andrea, but the editing time expired first. I also could have shown my Windows XP side of the machine which currently is running only Corrs wallpapers. These are the best desktops I have ever created. Simple, but totally cool. I wish I had a 3d card in my laptop so could use real transparency, but to be honest fake transparent terminals are easier to read anyway. I am fairly minimal. I have a hidden panel in the top right for the tray and a clock but that is it. 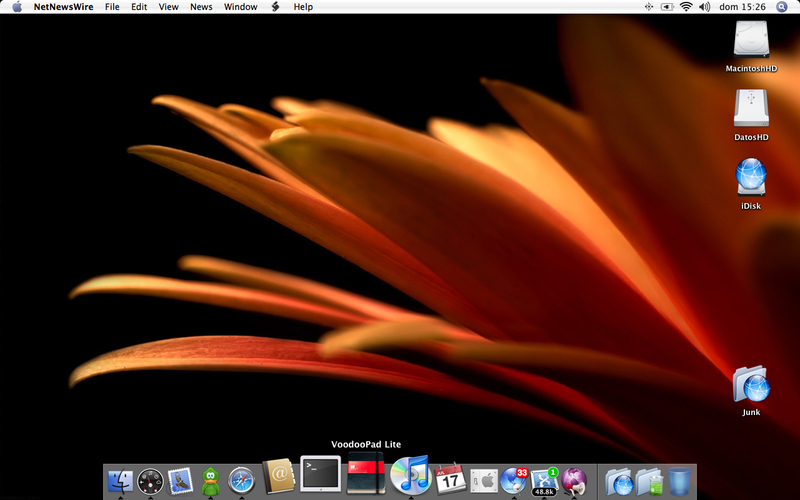 My Mac is the same way; I disabled the dock and removed everything but the menu bar. I rely on keyboard shortcuts and for things I do not have a shortcut to I just type the command. On the Mac I use Quicksilver for everything. So basically clutter on the desktop serves no purpose except to distract me. Both are xfce4, though I only recently (~ 2 months ago) switched from FVWM. The first uses xfwm for the windows manager. On the second I use beryl or xfwm if i am running dual screen. Well here is my desktop on Ubuntu Dapper. The panel has been congfigured to be very similar to that I had on GNOME 1.x many years ago. I have reverted to the standard Clearlooks theme which I find both businesslike and restful. The wallpaper is a representation of the Godesses Maat and Isis who look after me and the application is Ghemical showing the results of a simple quantum chemical calculation. FreeBSD with vtwm (cde like) as window manager. The OS I’m using on my main PC at home is Vista Ultimate x86 (Build 6000). I really like it, and I like the overall black appearance of things; it is easier on the eyes at night. I’d like to see a desktop contest. Maybe we can vote for the one we like the best. Oh man, are you my brother? Seriously… he keeps his desktop all crazy like that too. >Here’s my Vista laptop’s desktop (my main machine, basically). >The .png is huge, I am too lazy to resize. Nice shot, Thom, Vista actually looks pretty nice. Can I ask why you don’t run in your native tongue? Or aren’t translations complete in the eval copy? Because it is impossible to keep your UI consistent (lingually) when not using English. Other than that, Dutch is a horrible language. I prefer simple look so too much icons on desktop makes me mad. I used to use litestep at work… Until one day I was out sick and someone needed to find something on my system. Had to walk them through it. *sigh* Litestep came off the next day. 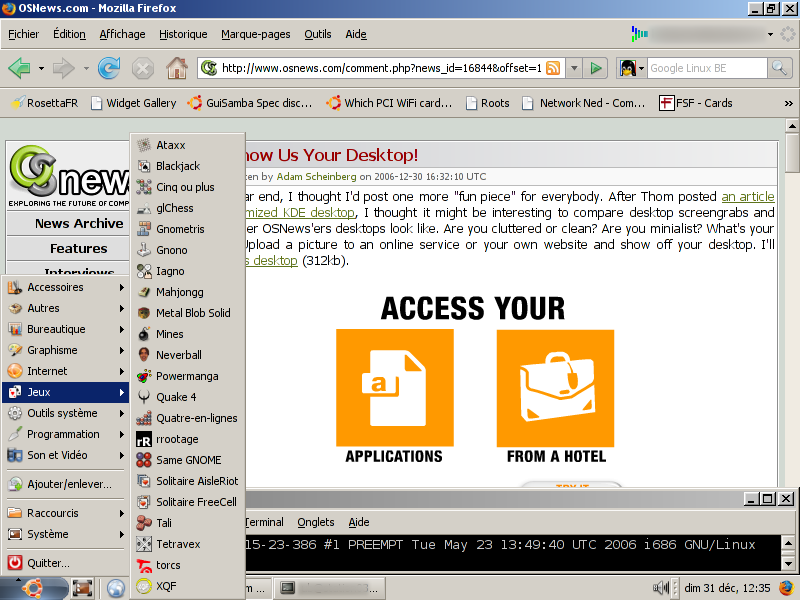 Screenshot of XP Home on notebook using xoblite fork of blackbox for windows. Cool, haven’t seen that before, now I’m going to try it on my XP laptop. Gnome 2.16 + Beryl based on Mandriva 2007. MurrinaNeo Graphite + Glass Icons + Emeralds Scaled Black Mod. Heres my latest with all of my windows shoved off to the side. Wallpaper is my latest work, check renderosity.com (my user there is Sord) to see the rest (not much). But all items on my desktop are standard. They work and don’t bother me too much. Heres a shot of my current desktop. On my NeXT that I use a LOT. the pic is a month or so old but thats still how it looks. Wow maybe if I installed GNUstep and ran it in monochrome I could get my desktop to look like that. 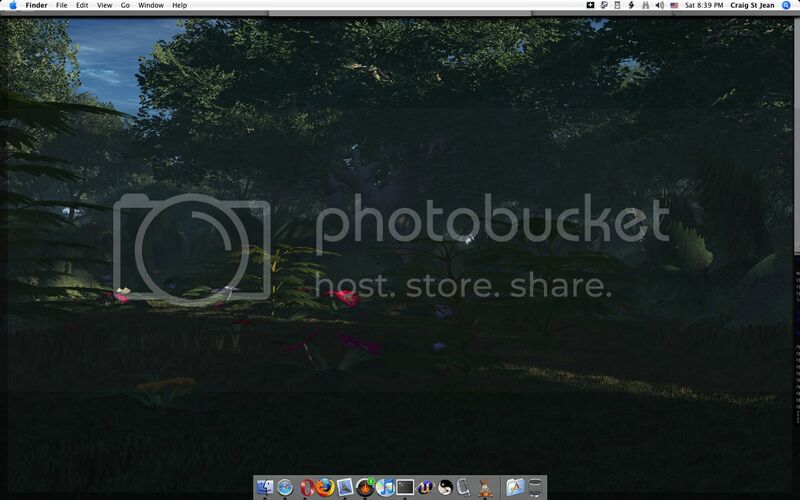 Just Ubuntu Feisty 64 with Resilience Theme and no 3D yet as Compiz ain’t quite there for me. 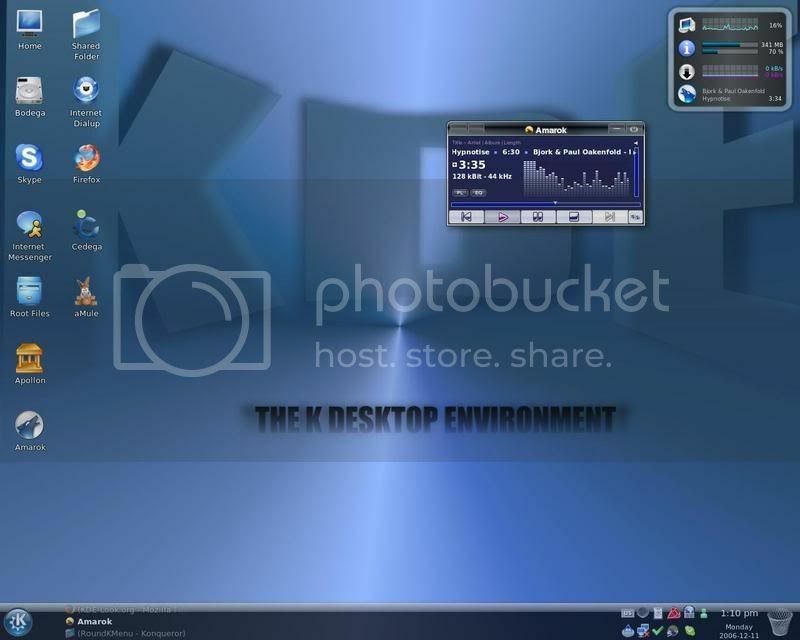 I’m using BBlean (Blackbox) on XP, with a program I’ve written myself that renders a wallpaper (which updates on the minute) and has a special circle-based file browser interface (which you can embed pictures in – like sticky posters – per directory). The temporary name for the project was “ActiveWall”, but I will be changing the name to “Sundew” for public distribution. Until I post the final app (maybe the source) for free – NO you can’t have a copy of it yet, it’s very beta. The small bead in the middle gently grows and sprouts (animated) icons in a round or square (not shown) fashion. I will continue adding features, but for now there will be no open widget api, as it changes too often and I’d hate to annoy people with a moving target. I will continue to post details at http://jam.t35.com since some of my friends have also taken interest. This is FreeBSD 6.1/KDE 3.5.4, it’s very simple. Something like this. Here are Yahoo Widgets, FAR Manager, XP themes, own background and own app. A nice collection of my latest screenshots under beryl. Lost a motherboard before Christmas, just built an AMD64 – Kubuntu system. I rarely post here, in fact, since registration started, I’d never even gotten around to registering until now. I’m a desktop junkie — if that makes sense. I used to be 100% console, but once I discovered FVWM I found I could make a truly capable desktop that made things fast and easy, but also good looking. The desktops you’re about to see are over a years worth of on and off configuring towards FVWM. They are built on a number of my own scripts/work as well as some other peoples. The presentation is minimal overall. The top 100 pixels or so is taken up by a media player (mpd front end) and a several line terminal. Both can be “rolled up” using F1 and F2, and a maximized window will go over them. The bottom bar is not complete yet, as eventually it will have more than a battery monitor and the pager on it. FVWM’s pager is perhaps the best I’ve ever seen. You can drag windows off of it, cross between two pages, like seeing the right half of the first and the left half of the second. You can even sidescroll through all your windows that way, breezing across however many desktops you might have. The ability to move windows in the pager and “pick” them from it is by far the feature I cannot do without. I can switch to an empty desktop, and pick windows from the three others right off the pager into the clean desktop. In addition to that, using a series of scripts I open music, videos, and images from my menu. I can even download and view the latest of my favorite comics, or select my wallpaper. Like others, I also have the thumbnailed view for minimized windows. All of this is sloppy focused to make fast use of middle click copy and paste. Anyway, all the graphical applications I use are GTK2 for the sake of a unified look and feel but also simply because I tend to prefer most GTK2 applications. I stay away from gnome libraries and gnome dependencies as much as possible, preferring the simplest applications to do the task at hand. Applications include Firefox, Thunar (file manager), Sylpheed (e-mail), Tea (text editor), GIMP, and PyMPD (for a mor iTunes like front end to my music). not a lot going on really but here it is. Old Linux and Mac screenshots. I think the Mac is 10.0 beta or maybe 10.0. Yeah, they have some nice art there. I need to find that picture again, I had totally forgotten about it. I just bought two new disks and striped them into RAID0, so Vista gives me the highest possible disk perf index. The rest is: Core 2 Duo, 2GB DDR2 PC6400 and ATI X700. My friend and I are having a disagreement over which is better, having a nice picture in the background – or funtional features. I say functionality is more important, and besides – I can incorporate a background image if I wanted, but I preferred the simple beauty of gradients. Besides, there are folder-linked images that display wallpaper-stickies, so there is a kind of wallpaper – it just changes. I don’t even have a tasklist, I use alt+tab or the middle mousekey on the desktop. my desktop is a mixture of SGI, HP-UX and OSX GUIs (well, sort of I am running CentOS and FVWM 2.4.x as my window manager. Happy New Year to all OSNews readers! 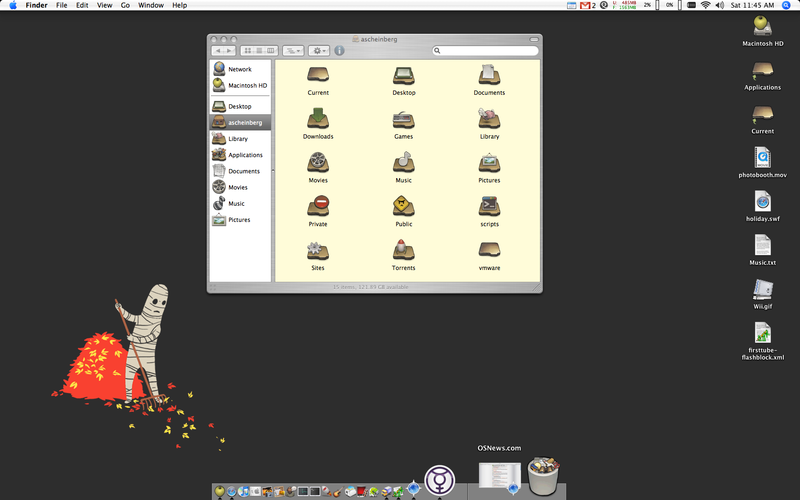 Although OSX is on my main Mac, I still use my OS9 Mac daily! This is my desktop running on a dual P3. Its a octane dual300. It runs irix 6.5.27 and some kde stuff from nekochan (big thanks). Thats my Gentoo + Fluxbox desktop. The screenshot is taken in may but it still looks exactly the same now. Thanks for giving the link of your wallpaper ! gnome-terminal in fullscreen, with VI to edit some C code development. GNOME 2.16 + Clearlooks + (modified) Mist icon theme. On Gentoo. 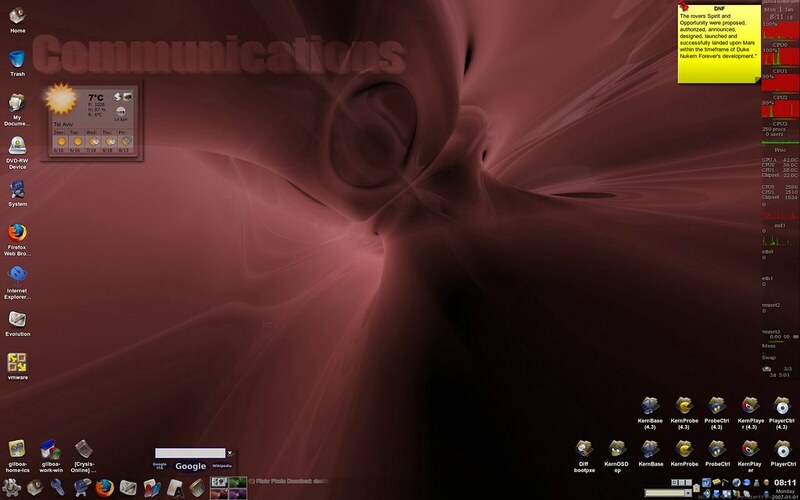 The only difference with my current desktop (the picture is quite old), is that the email client is now on the right side, and the Trillian/Winamp is on the left side of the screen (so this way I can access the desktop icons too). 😉 Happy new year everyone! This is my Program Manager as it looked in 1995, just before ruining it by installing Windows 95. Yes, I really used _that_ color for window title bar, and I still like some of the concepts in the Win3.1 interface. There are (surprisingly?) quite many dwm screenshots here already, but one more shouldn’t hurt. This is uncluttered desktop at its best. No root menus, no icons, no menu bars, no nothing. The temperature readings are my two Pentium III processors. My last Windows XP desktop for 2006! Heres mine, I like to keep things tidy. A screenshot here with the wonderful snow-plugin for Beryl running on Ubuntu Edgy. Here is my contribution. I keep my machine clean and organized. Thankfully, being sunday it’s a slow morning. This picture is pretty old, but I submitted it an Architextual (that’s not spelt right, but looks nice to I’m leaving it) forum a few months ago, and I’m too lazy to upload another to photobucket. 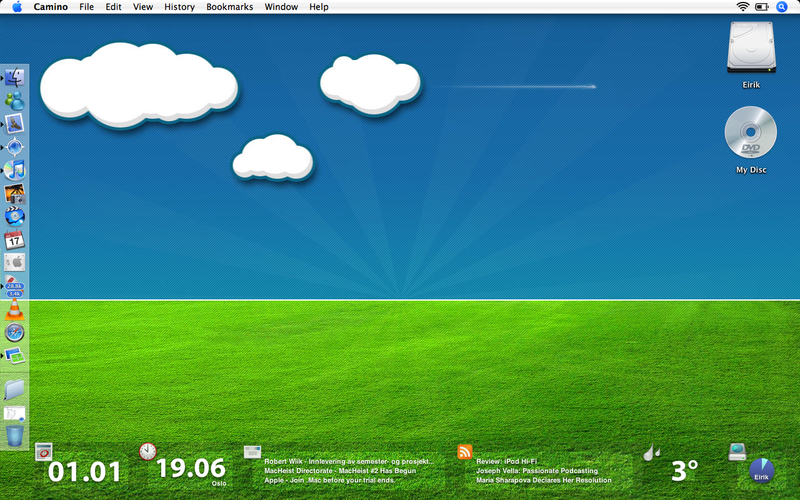 Here’s a screenshot of my current desktop. I run Windows XP SP2 (heavily personalized) and run Kubuntu in a VMWare virtual machine. Unless I am using Kubuntu to do something graphics-heavy, I normally run its software through an X-Server running on Windows which allows me easily use Linux software and Windows software together. 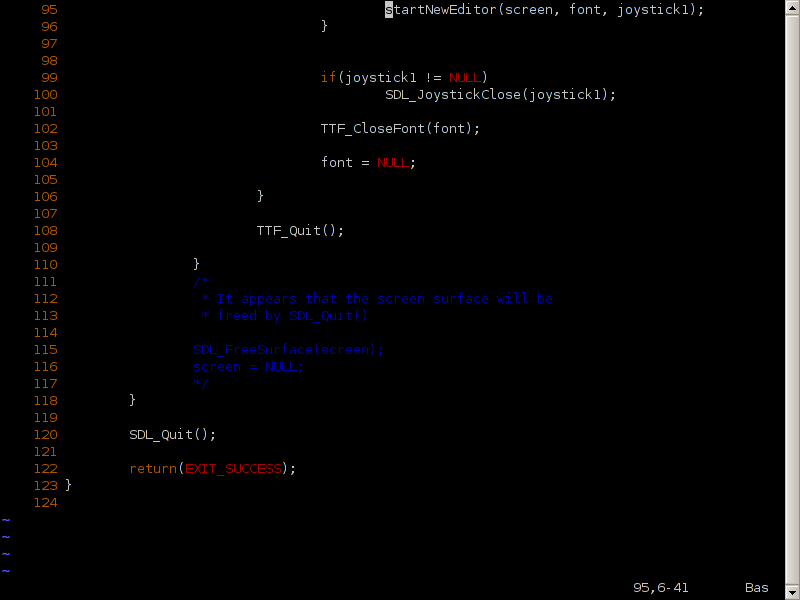 I get the transparent effects via Ecliz_Deluxe2 (Ecliz_Deluxe_Tranz scheme) skin for Windowblinds. The icon bar on the right is Windows PowerPro as is the text above the system tray. The start button has been removed (with StartKiller) and replaced by Free Launch Bar menus. there’s a little bit going on on the kicker.. Excuse me, but why was my post modded down? Because they think your desktop is ‘orrible? Maybe they don’t like the “bloke” wallpaper, not to my taste either, but I wouldn’t mark people down for their personal tastes. but there you go. That’s not a valid option for moderating down posts, now is it? My first Mac! The Mac 512k with System 3.3 I still use this machine all the time to play classic games like Asteroids, Pac-Man, etc… I just haven’t got over this one since I got it in 1984! I got the same wallpaper somewhere, too bad my friends mock it. 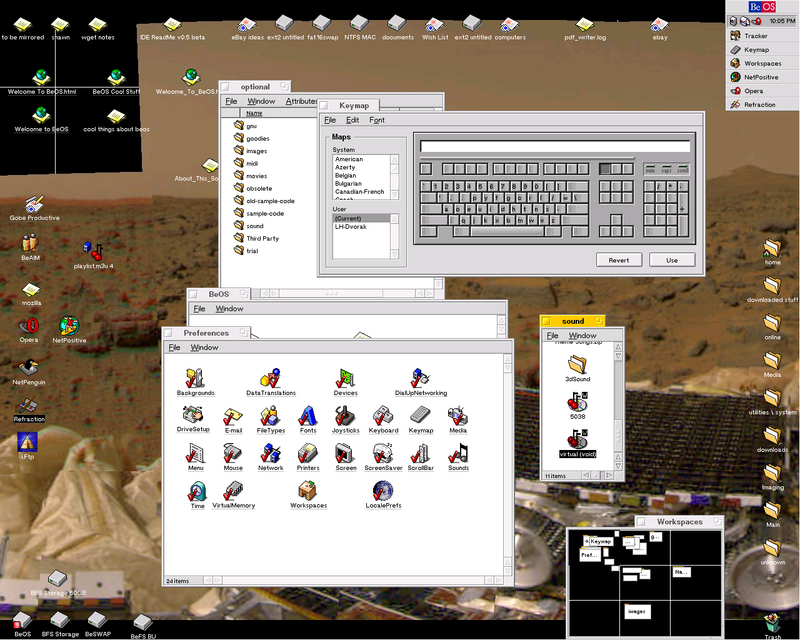 Here is my BeOS5 desktop running on Pentium III with old stabile Mozilla and Midnight Commander as file manager. Now called Window Maker, my favourite window manager. To each his own I guess. and the necessary dockapps in the lower right. Where did you get that wallpaper? BeOS is my primary operating system and will continue to be for some time. Here is the desktop of one of my more frequently used systems. I’m impressed… How are you moving Gnome menu’s outside of the application?